We love animals. But not everyone has resources, time, or will to pursue a masters degree in veterinary medicine. If you happen to belong to this group, a career of a vet technician will be a perfect choice for you. In less than two years you can earn your associate degree, and start working with one of the veterinaries, doing what you always wanted to do, helping the animals. Prepare for a tough competition in your interview. Veterinary technician has become a popular career choice recently. And while there are millions of animals to take care for, the number of places where you can work (animal hospital, private vet medicine practices, etc) is still limited. In average, more than five people will compete with you for the job. Five candidates, but just one new job contract. Will you be the one who gets it? We will try to help you with it. Why have you decided for this career? Tell me more about your school, the subjects. Tell me something about your past working experience (internship). Veterinarians spend a lot of the time with their technicians. They will never hire for the job someone they do not feel good with. 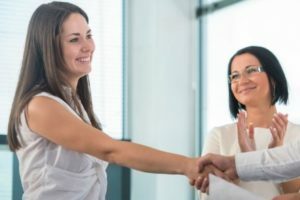 First and foremost, your goal is to make a good connection with the vet in your interview. Now it doesn’t mean to bring them presents, or flirt with them, or anything of that kind. It means to show enthusiasm for the work, ask them question, listen carefully, and find topics and things you have in common. We live in an era of social media. Sad but true. Search for the name of the veterinary you’ll interview with. Try to find something about them, and look for things you have in common. A mutual hobby, perspective, or anything else you share with them. Then you can refer to these things in an interview, when you get a chance to talk about your hobbies and personal life. Even if you do not find anything you two have in common, you can still make a good connection. Certain things do always work: showing enthusiasm for the job, praising the vet for their good work, demonstrating listening skills and a humble attitude. All these things will help you to make the right connection, which is absolutely crucial for your success. In my experience, vets won’t ask you any technical questions in this interview. They will go through your resume, ask about your experience and past jobs (if you had any), your motivation, hobbies, availability, salary expectations, and they may ask you one or two behavioral questions. Let’s have a look at few questions. Most people will say that they like animals. This is a good answer, but you should add something to it. Say that you have the skills and abilities to become a good vet technician, such as empathy, teamwork ability, good listening skills, detail oriented personality, sense for responsibility, and the technical skills. You can even say that after completing your training program, and learning what you will actually do in the job, you feel even more motivated and determined to pursue this career. You should focus mostly on practical subjects, and subjects that are directly connected with the actual job. Animal anatomy and physiology, veterinary office management, pharmacology for vet technicians, clinical internship, clinical pathology, anesthesiology, radiography, etc. Do not forget to talk about your school with enthusiasm. You do not need to go into details with the subjects, such as particular topics of study or things you learned. If they want to know the details, they will ask. Here you have two options. Either you can list the basic duties, such as initial evaluation of the animal’s condition, cleaning and wrapping wounds, collecting samples and administer medication, etc. Job description should help you with the entire list (if the particular vet does not advertise the duties, look for another job description from another vet, where they publish the complete list of duties). Another option consists in saying that you plan to be there for the veterinary, and assist them with all the tasks they will perform, ranging from clinical to administrative. 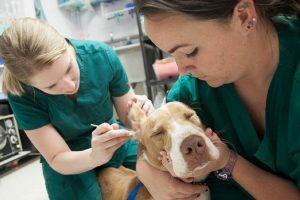 As I already mentioned at the beginning of the article, vets spend a lot of time with their technicians. It helps when two people have something in common (at least the same level of intelligence). Mutual hobbies and interests are always a good topic for a friendly conversation. The best advice I can give you is this one: try to name many hobbies. The broader you get, the easier it will be for the vet to identify something the two of you have in common. Good idea is to tell them a story. Something that remains in your mind, long after you finished your internship. Perhaps you participated on saving animal’s life, or you exceeded someone’s expectations with your work and service. You can also list a few common health conditions/situations that you experienced in the job, and helped to address. Once again, try to talk about these things with enthusiasm, so the vet get the feeling that you enjoy doing your job. Google for the average salary for vet technician in your country (state), and start with this number in you interview. This is not one of the jobs that offers room for salary negotiation. What motivates you the most in this job? What do you want to accomplish in this position? How do you feel about seeing a dog dying? What do you consider the most difficult aspect of this job? Interview for a position of a veterinary technician may look easy (becasue of the questions), but it is not easy. You will typically compete with many candidates for a single job contract, and the margins can be razor thin in this interview. Demonstrating the right attitude to work, to animals, and also to life in general. Making a good connection with the veterinary. 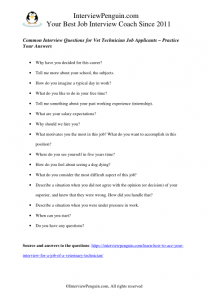 Giving the right answers to the questions in an interview. Interview Success Package – A guide on how to win the hearts of your interviewers, and brilliant answers to thirty most common interview questions. Stand from the crowd and get the job!